Find out more about DTML's conditional expressions and comparison operators. In the first part of this article, I explained the basics of DTML, giving you a crash course in objects, methods, variables and acquisition. I showed you how to use the Zope management interface to construct your own objects and methods, and also demonstrated how Zope looks for variables. Finally, I showed you how to use Zope's variable-formatting routines and structured text rulesets to format and manipulate output. In this second tutorial, I will be delving a little deeper into DTML, looking closely at the constructs it offers to add decision-making logic to your code. I'll be examining conditional expressions and comparison operators, and demonstrating, with practical examples, how they can be used to craft more intelligent code. So let's get going! The "condition" here refers to a conditional expression, which evaluates to either true or false. Let's look at a piece of code to understand this better. Here's a DTML Method named "ifOnly", created in the same "DTML Basics" folder I used last time. Variable "id" exists and has the value DTML Basics. If you take a close look at the code above, you'll see that it includes two "if" statements; however, only one is displayed in the output. This is because the first statement evaluated to a true value, because the variable "id" exists and has a value (the name of the container within which the DTML Method is stored). However, the second DTML variable "myName" does not exist. As a result, the corresponding "if" statement evaluates as false, and so, the text enclosed within the <dtml-if> block is not displayed. I wonder if you've heard of Shakespeare, <dtml-var name>. Welcome to the Matrix, Neo. In this case, since the conditional expression in the "if" statement evaluates to true, the output displayed by the script will be different. you need to first tell the DTML interpreter that you're talking about an expression and not a variable. And that's where "expr" comes in - it lets Zope know that it's dealing with a conditional expression, and not just a regular variable. In addition to the "if" statement, DTML also offers the "if-else" construct, used to define a block of code that gets executed when the conditional expression in the "if" statement evaluates as false. As you can see, this construct can be used to great effect in the last example - instead of two separate "if" statements, we can combine them into a single "if-else" statement. Don't take my word for it. Fire up your browser and see for yourself. And here's an example that demonstrates how to use it. Create a DTML Document named "selectDay". 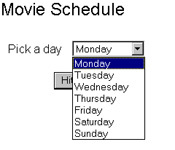 As you can see, this is simply a form which allows you to pick a day of the week. The real work is done by the DTML Method "showMovieForTheDay". In this case, we've used the "if-elif-else" control structure to display the appropriate move for the day. There's one important point to be noted here: as soon as one of the "if" statements within the block is found to be true, Zope will execute the corresponding code, skip the remaining "if" statements in the block, and jump immediately to the lines following the entire "if-elif-else" block. For the adventurous amongst you, DTML also lets you "nest" conditional statements - for example, this is perfectly valid DTML code. But you'll agree that is both complex and frightening. And so, in addition to the comparison operators I've used so liberally thus far, Python also provides the "and", "or" and "not" logical operators which allow you to group conditional expressions together. The following table should make this clearer. You'll have noticed that in all the examples shown thus far, we've used two Zope objects - a single DTML Document containing the form, and a separate DTML Method which processes the form input and generates appropriate output. However, DTML provides an elegant method to combine those two pages into one via the "submit" variable. Welcome to Earth, <b><dtml-var species missing="Alien"></b> from the planet <b><dtml-var planet missing="Zorgo"></b>. How was your journey? Travelling <b><dtml-var distance missing="so many"></b> light years must be quite a shock to the system. Why don't you relax and have a drink? In this case, the DTML "if" test will first check to see if the "submit" form variable exists. If it does, it implies that the form has been submitted, and the second half of the script, the actual form processor, comes into play. If it doesn't, it implies that the form has not yet been submitted, and so the initial, empty form is displayed. And that's about it for the moment. In this article, you learnt a little more about DTML, specifically about how to introduce decision-making logic into your Methods with DTML's numerous conditional statements. You learnt about the "if" and "unless" series of conditional statements, and saw a few examples of the different variants possible. Finally, you saw how all that theory can be put to practical use by implementing a simple form processor for use on a Web page. In the next issue of DTML Basics, I'll be rounding out the fundamentals with a look at the various loop constructs provided by DTML. As with everything you've seen so far, DTML comes with its own twist (pardon the pun) on the traditional way of implementing loops. Come back next time to see what I'm talking about...and, until then, go practise. This article was first published on 27 May 2002.